11 Years of Friendship—and Counting! Tom Melita and Cass have been together for 11 years. Tom adopted Cass as a young puppy from a family friend who had a litter of standard poodles, and it’s been heaven ever since. 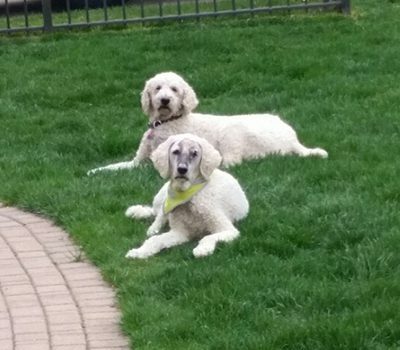 Now the Melita household includes three other dogs: Mack (a standard poodle that Tom calls Cass’s twin), Charlotte, and Paige. Ever since he was a puppy, Cass has been a mellow, affectionate, and very loyal dog. According to Tom, Cass is very smart and attentive, and he shares a special connection to the entire family. With Tom being a former football player at the University of Michigan, it’s no surprise that Cass has adopted some of his dad’s energy and personality. His favorite activities are going on daily romps and running around with his family. 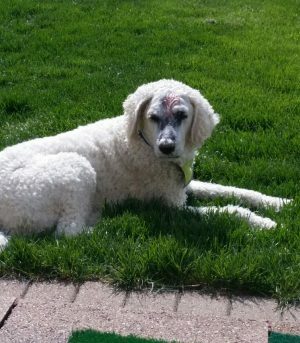 In late November 2016, Tom noticed 11-year-old Cass had slight swelling over his left eye, with some discharge from the eye. Alarmed, he took Cass to the local animal emergency hospital to be examined. Suspecting the cause was cellulitis or an infection, the veterinarian sent them home with antibiotics and steroids. At first the medication seemed to alleviate Cass’s discharge and pain, but unfortunately, the swelling did not go down. Soon after the medication was finished, Cass had bloody discharge from the left nostril. 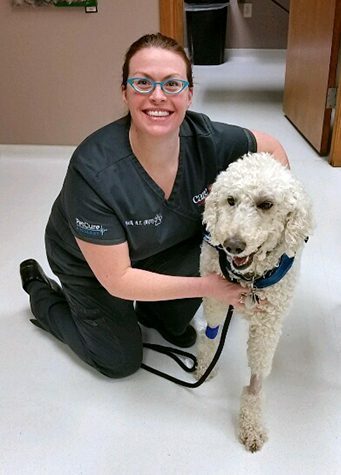 At this point, Cass’s primary care veterinarian suspected Cass had a nasal tumor and referred Tom to Michigan State University’s Veterinary Medical Center, where Cass could receive a CT scan and have a biopsy done. The tests and CT scan confirmed that Cass had a large, cancerous nasal tumor on the left side. It seemed to spread to the right, extending behind his eye area. The biopsy failed to identify exactly what type of cancer Cass had, but the doctors strongly believed it was carcinoma. Cass’s diagnosis was like a hammer to Tom’s heart. The dog had not had any previous medical concerns, so the news that he had the C-word was heartbreaking. Radiation therapy is the standard treatment method for nasal tumors, but conventional fractionated radiation therapy (CFRT) required 20 treatments. Tom was concerned about putting Cass under anesthesia 20 times, so he decided to collect his thoughts and research other resources and options. In the meantime, Cass was placed on Palladia, a prescription cancer drug typically used to treat mast cell tumors in dogs. After doing some research, Tom was distressed to find that nasal carcinoma had limited treatment options and a poor prognosis. He was still debating whether to proceed with CFRT when he came across a television news segment on YouTube about PetCure Oncology and stereotactic radiosurgery (SRS). The video ignited in Tom the hope that there was a treatment option that would give Cass a chance for a cure. With SRS, high doses of radiation are delivered with sub-millimeter precision, therefore requiring fewer sessions. Tom decided to reach out to PetCure Oncology at Care Center in Cincinnati, Ohio, to find out if Cass would be a candidate for SRS. After communicating with Dr. Kelsey Pohlmann, who heads PetCure Oncology at Care Center’s radiation oncology department, Tom decided to pursue SRS for Cass. Their stay was arranged at a pet-friendly hotel, and Cass received three SRS treatments from February 8 to 10, 2017. As of early May 2017, Cass is breathing normally, acting normally, and enjoying life. The only side effect Cass had was hair loss in the treatment area, but it began to grow back within two months. With radiation and continued treatment with Palladia, Tom is hopeful and committed to giving Cass every opportunity for a longer life. Our team is ready to provide you with guidance on your pet’s cancer journey. If you would like to schedule a consultation to discuss treatment options for your pet, please contact the PetCure Oncology location nearest you.